More than 17,000 Eagle County households received this survey in the mail. The printed deadline to return the survey was Aug. 22, but county officials noted they are still accepting input regarding operation of its open space program. 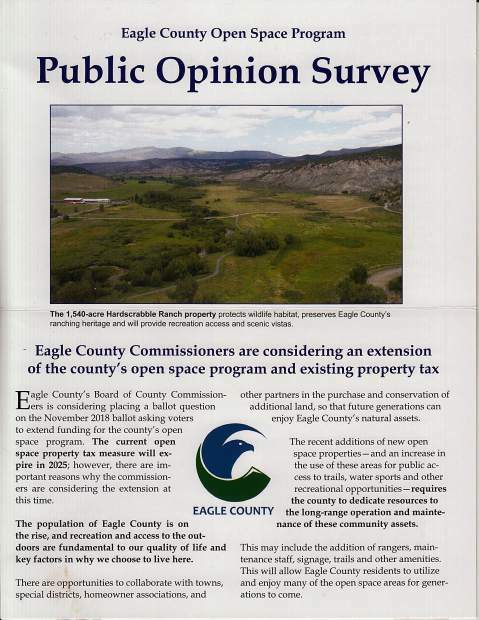 EAGLE — Eagle County still has more than six years to collect property taxes earmarked for open space purchases, but looking to the long term, the county commissioners plan to place a measure on this fall’s ballot to seek an extension of the tax. On Tuesday, Sept. 4, the commissioners will consider a resolution for the ballot issue. The ballot question will ask county voters for permission to extend the existing open space property tax for 15 years beyond its current expiration in 2025. In 2002, voters approved the 1.5 mill property tax to fund the county’s open space program. The tax generates approximately $4.5 million per year, and funds collected are used to acquire, maintain and permanently preserve open space countywide. County officials say results from a recent telephone poll and a community survey show strong support for the open space tax extension. • Four out of five voters would vote yes for an open space continuation ballot measure. • The proposal has support across party lines, with 71 percent of Republican, 79 percent of unaffiliated and 92 percent of Democratic voters indicating support. • 85 percent of respondents said “preserving wildlife habitat” is extremely or very important. • 83 percent of respondents indicated both “conserving the scenic beauty of our county” and “maintaining our good quality of life” are extremely or very important. In addition to the poll, in early August a community survey was mailed across the county to 17,403 households with active voters. The surveys indicated 69 percent of respondents would vote yes on an open space continuation ballot measure. Along with the residents who received hard copies of the survey, responses were accepted online at http://www.eaglecounty.us/openspace. Respondents were asked to submit comments by Wednesday, Aug. 22. The county’s open space funding is secure for more than six years, so why is the county going for an extension now? Ryan pointed to the Hardscrabble Ranch purchase as an example. The $15 million purchase deal for the 1,540-acre property, formerly part of the Adam’s Rib Ranch along Brush Creek south of Eagle, took more than three years to negotiate in partnership with the Eagle Valley Land Trust and private donors. “Open space purchases are complex deals. They need longer amounts of time to put together, and it can take several years to pull together the funding,” Ryan said. If county residents want to continue the open space program, and the polling and survey results indicated they do, Ryan said it’s best to get the extension in place. Additionally, if the tax doesn’t pass this fall, the county will have time to go back to the voters with a second request closer to the expiration date. A summary of the polling and survey results is available online at http://www.eagle county.us/commissioners.